The National Association of State Directors of Veterans Affairs' (NASDVA) endorsement of the Academy’s Have You Ever Served in the Military? initiative is a tremendous benefit and resource for Veterans and their family members. The Academy provides all State Directors with a complimentary starter kit of initiative materials. 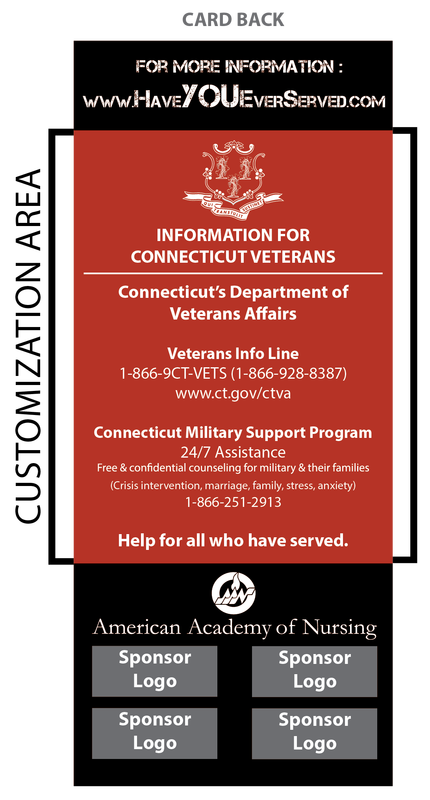 After the initial starter kit, you can order customized clinician pocket cards containing important information about your state’s Department of Veterans Affairs for a small underwriting sponsorship that covers printing, shipping and related costs. You may wish to include information such as your website, telephone number(s), email address and Veteran hotline. Please see the example to the right. Customization texts and images are limited to the customization area on the back of the card. The information on the front and inside of the card cannot be changed. Font, vector images, and logos must be white; no other color will be accepted. The font (other than the logotype) must be Myriad Pro and generally no smaller than 10 points. The Academy’s and national sponsors’ logos must remain along with the link to the initiative’s website. If you are interested in receiving a starter kit or ordering customized Have You Ever Served in the Military? clinician pocket cards, please contact Kim Czubaruk at Kim_Czubaruk@aannet.org.